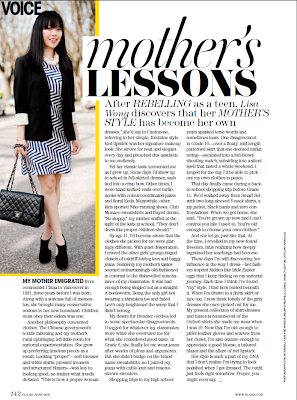 In case you haven't heard via Twitter, I have an article in the June 2011 issue of FLARE magazine! As a fashion blogger and professional writer there's no greater thrill, especially since I'm also a subscriber and devoted reader. Many thanks to editor-in-chief Lisa Tant for this amazing opportunity to tell a very personal story; managing editor Catalina Margulis for her insightful editorial comments and professionalism; photographer Evaan Kheraj for the great job he did on the photoshoot; and hair and makeup artist Melanie Neufeld for making me look amazing. And last but not least, thanks to my mother for all the love, patience and support she has shown me over the years. The June 2011 issue of FLARE is on news stands now, so pick up your copy today! I hope you enjoy reading the article as much as I enjoyed writing it. Congrats Lisa! What an accomplishment and you so deserve it. Such a shame we don't get Flare over here, or else I'd definitely pick up a copy to read your article. Congrats on the publish Lisa!! This is great! I never knew you went through such a time but then I never knew you very well to begin with : ) I enjoyed reading this article very much and seeing how your mother's style influenced your own is wonderful.. I don't know why but what I used to think was old fashioned and uninspiring, is what I consider formal and tasteful when I look at vintage these days. Mother influence? I don't think so.. but maybe more so my grandmother though. Keep it up Lisa, happy for you! I've been meaning to congratulate you-I just read this article a few days ago. It was a great article! I think it's great to have a woman that you can look up to for style. My mom and I have very different styles-I've always been drawn to more edgy things. Your mom reminds me of my grandma though. Even when she was in her 80s, she always dressed very well and took a lot of time and thought into her outfits. I really admired her, she was always so put together. Whoo hoo Congrats!!! Fabulous photo too. So happy for you! So proud of you girlie! Fabulous article - I like! Very eloquently put. Ahhhh too bad they don't sell Flare in the UK! Definitely a part of Canada I miss. Hey, I recognize that dress! Wow, congrats! And also, OF COURSE this should have happened to you! I have loved the content and point of view of your blog since Day 1. Your writing is great; your style is great; OF COURSE you'd get featured! Congrats, congrats, and can't wait to see more! Congratulations on the publishing of your article. I know I could read it on your post but I just subscribed to FLARE so I am going to wait until i get the issue to read it.